The NCS – Natural Colour System ®© has been developed in the 60s of the last century in Sweden based on interdisciplinary approaches. Today it represents an instrument of great design effectiveness for its universality temper compared to the different productive techniques: indeed, it provides an almost unlimited number of areas of application, from paint to laminate, from plastics to ceramics. It is currently adopted in many countries worldwide. 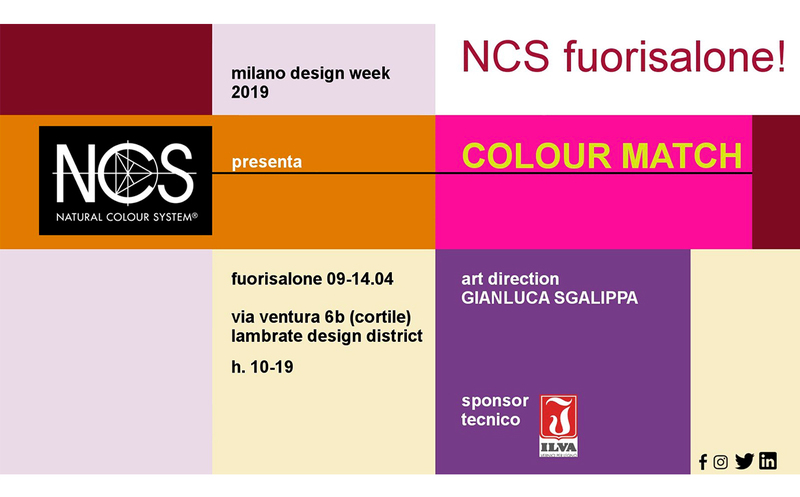 For over 10 years, NCS Colour Centre Italia, based in Milan, is active in the NCS System®© diffusion over all the Italian country through licenses released to producers and shops, in addition to sensitizing different professionals categories (architects, designers etc.) to its use in design practice. The number of users is growing rapidly, above all thanks to the basic features of the NCS System ®©: versatility, reliability and rational approach. NCS is also particularly involved in teaching. Training courses for professionals for the acquisition of CFP, seminars for sales points for the refinement of sales techniques for the decorative product and customized training proposals through learning paths modeled on specific customer needs addressed to companies, represent a consolidated activity with a great public appeal. The artistic direction of the event was entrusted to Gianluca Sgalippa, designer and critic of design, professor at the Academy of Fine Arts of Brera. Sgalippa is also part of the training team of NCS Colour Centre Italia. Subject of the presentation are the 15 works awarded so far, which from the digital version have been transposed to the pictorial version: thanks to the technical support of Ilva varnishes for wood, one of the largest and most important brands in the world in its sector, which supplied the paints, 15 paintings 50 x 70 cm were made, ordered as real pictorial works, according to a criterion normally adopted in art galleries. The COLOUR MATCH event is structured on a rigorous and rhythmic set-up, with chromatic works contained in a large white box. The initiative is also an opportunity to compare many approaches to the world of color and individual sensitivity to a theme that, in the context of the project, has had alternating fortunes and importance. The chromatic panels, shown in sequence, are replicated as an extended surface in another part of the room. It is a colorful background for selfies: a playful and media interpretation, in line with the sphere of contemporary communication, for a very articulate topic rich in creative resources. The NCS Colour Centre Italia event will take place within the framework of the Lambrate Design District, which has been one of the most effervescent and international areas of the Milan Design Week for years. Hosted at the Galleria Monopoli (via Ventura 6B, in the courtyard), the presentation is open to the public from Tuesday 9 to Sunday 14 April, with hours 10-19. Extended opening at 10 pm and drinks scheduled for Wednesday 10.